2007-05-17 Application filed by Numerex Corp. filed Critical Numerex Corp. Customer Premises Equipment (CPE) product implementations for current wireless data systems typically utilize an integrated assemblage of components that function cohesively, from the customer's perspective, as a single entity. Such multi-component products are typically housed within a single enclosure and deployed as a single product. All components are mutually interdependent upon each other and upon the underlying wireless data transport service technology that conveys the data transmitted and received between the CPE product and centralized host computer servers of the service. Thus, when a fundamental technical change occurs in one of the elements comprising such a product, or in the underlying wireless data transport service, the entire CPE product often becomes worthless until it can be completely redesigned. The costs of a rapid product redesign and service disruption while waiting for deployment of newly developed versions of the product would be excessive and prohibitive. Accordingly, there presently exists a need in the art for a software or hardware transition technology that can be interfaced with legacy CPE wireless data equipment in order to upgrade the equipment to allow it to interface with new wireless data transport technologies. SUMMARY OF THE INVENTION The digital upgrade system prolongs the life of CPE wireless data products when presented with fundamental technical changes to the product's operating environment that would otherwise render the product inoperable or having limited utility. By way of a representative example, the subject technology will allow wireless data products, such as the "1650" wireless device, marketed by or on behalf of Numerex Corp., to be upgraded to handle digital cellular telephone services, such as the digital Short Message Service (SMS). Figure 1 is a block diagram illustrating an operating environment for a conventional wireless data product deployed on a customer's premises. Figures 2A, 2B, and 2C are block diagrams illustrating an exemplary operating environment for a digital upgrade system. Figure 3 is a block diagram illustrating an exemplary embodiment of a digital upgrade system. Figure 4 is a logic flow diagram illustrating an exemplary method for implementing a digital upgrade system. Figure 5 is a state diagram illustrating an exemplary method for implementing a digital upgrade system. Figure 6A and 6B are logical flow diagrams illustrating exemplary methods for implementing a digital upgrade system. Referring now to the drawings in which like reference numerals represent like elements as noted in the several figures. Figure 1 illustrates a CPE Host 105 utilizing a conventional analog radio transmitter 120 receiving data from a data service provider 145 through a client server 150. In this configuration, the CPE Host 105 is located remote from the client 140, although the CPE Host 105 could also be local to the client 140. As illustrated, the data product functionality module 110 (i.e., signal processing function) of the CPE Host 105 corresponds with the analog radio 120 to transmit information over the network control channel wireless transport 130 through a network link 125. The functionality module 110 comprises the logic that enables the particular application to utilize wireless data. For example, the functionality module 110 may enable a security alarm function, a vehicle location service, or an equipment operation monitor, among other functions. It should also be understood that the functionality module 110 may incorporate external interfaces that are not shown in the exemplary embodiments contained herein. Such interfaces may include, but are not limited to, door or window sensors, GPS locations, and speed sensors. In any of these cases, it is the logic program within the functionality module 110 that customizes the product application with the other parts of the wireless CPE Host 105. When the wireless transport 130 receives data from the CPE Host 105, it transports the data to the data service provider 145 through communication link 135. Once receiving the data, the data service provider 145 can communicate with the client server 155 through a communication link 150. Thus, according to Figure 1, the CPE Host 105 and client 140 are both in an environment where wireless data transport occurs over an analog network. Accordingly, if the client 140 and the control channel wireless data transport 130 are upgraded to digital communication protocol, such as Cellemetry® SMS, the analog radio 120 and the data product functionality module 110 of the CPE Host 105 would no longer be able to communicate with the rest of the network (e.g., the digital wireless data transport). Hence, in this conventional network, the entire CPE Host 105 would need to be upgraded if the wireless network 130 and client 140 were upgraded. Figure 2A illustrates an operating environment for a digital upgrade system 200, according to an exemplary embodiment. If, for example, a digital SMS wireless data transport 210 replaces the conventional analog transport 130 (as depicted in Figure 1), the digital upgrade system 200 can be utilized at the CPE Host 105 to continue to operate with the functionality module 110 over communication link 115. When the digital upgrade system 200 is installed in the CPE Host 105, as illustrated in Figure 2A, the functionality module 110 can then communicate with the client 225 over the digital wireless data transport 210 as it had done previously with the analog radio transceiver 120 and analog network 130 (as depicted in Figure 1). The service provider 230 can communicate with server 240 over communication link 235. The host computer server 240 of the client 225 may comprise a data service provider 230 and a client server 240. The client 225 would typically be the provider of the application to the end customers utilizing the wireless data customer premise product. Communication link 235 represents the link between the data service provider 230 and the client server 240. Typically communication link 235 would be a communication circuit such as a modem, private line, telephony network, or the Internet. To accomplish the digital upgrade capabilities, the digital upgrade system 200 can comprise a software module 245 and digital radio module 255, as illustrated in Figure 2B. Alternatively, the digital upgrade system 200 can comprise a joint digital radio and software module 260, as illustrated in Figure 2C. The software module 245 is capable of translating commands or messages between a legacy CPE Host 105 and the digital radio module 255. The digital radio module 255, in turn, can communicate with a digital radio network, such as an SMS network. According to an exemplary embodiment, the software module 245 and digital radio module 255 (or combined software module and digital radio 260) have linear dimensions and a configuration similar to that of the analog radio transmitter 120 that it is replacing. That is, according to an exemplary embodiment, the digital upgrade system 200 fits within the pre-existing form factor of the analog wireless data device that it is designed to replace. As illustrated in Figure 3, the digital upgrade system 200 can be integrated upon a new circuit board 300 that has the same factory pins for the host as the original analog radio transceiver 120 (as illustrated in Figure 1). Specifically, in this exemplary embodiment of the digital upgrade system 200, a pin connection on host 330 connects with a pin 305 of the new circuit board 300. Interface requirements and interaction protocol of the new digital radio will be profoundly different from those of the analog radio transceiver. Therefore, the purpose of the software module is to translate the protocol from that utilized by the previous analog module to that required by the new digital radio. The software translation permits the data protocol products functionality module to continue using the original protocol originally utilized by the previous analog radio. The purpose of the interconnecting wiring, which is physically part of the circuit 300, is to translate the physical wiring from that utilized by the previous analog module to that required by the new digital radio. Therefore, as illustrated, the pin header 305 fits precisely within the original pin connection 330 on the CPE Host 105 host. Despite fitting perfectly with the old analog pin connection 330, the pin header 305 connects to a new digital protocol converter 310. One exemplary embodiment is represented by an AMPS analog to SMS digital converter. The digital protocol converter 310, in general, translates the analog signals that are expected by the CPE Host 105 to digital signals that can be communicated across the new digital network 210 (as illustrated in Figure T). The digital protocol converter 310 then connects with a SNT header plug 315, which connects to a digital radio chip 320 and ultimately to an antenna 325. The antenna 325 is a digital antenna that can send and receive digital data through the digital SMS wireless data transport 210 (as illustrated in Figure 2), thus allowing the CPE Host 105 and functionality module 110 to communicate with the new digital components 210, 230, 240, as illustrated in Figure 2. Because the pin connection host 330 is not changed to connect to the pin header 305, the original design of the functionality module 110 of the customer services equipment is not altered, but is preserved. For this representative update task, the only piece that is required to be removed from the CPE Host 105 is the analog radio transceiver 120, which is replaced by the digital upgrade system 200. Now turning to Figure 4, an exemplary method for converting a signal from AMPS analog to SMS digital service is illustrated. It is noted that this is one of many embodiments of utilizing the digital upgrade system 200. It is envisioned that the digital upgrade system 200 can perform any analog to digital wireless protocol conversion, as required by the specific implementation. Thus, the digital upgrade system 200 comprises a "protocol translator" to translate analog to digital commands and vice versa. In alternative exemplary embodiments, this protocol translator is implemented using: (1) a separate microprocessor and program; or (2) application software embedded in the radio itself, such as Open AT. Open AT is a concept which allows unused MIPS and Flash in a radio to be used for user programs (such as the converter routines). 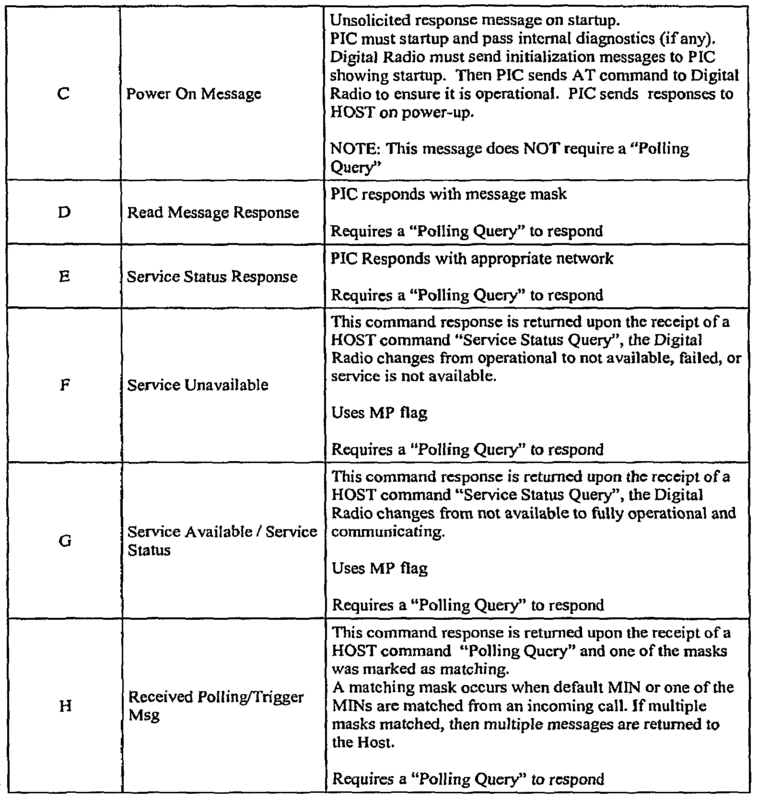 In the exemplary embodiment illustrated in Figure 4, the converter of the digital upgrade system 200 translates a command/message (i.e., signal) that is expected by the functionality module 110 of the customer services premise device 105 (as illustrated in Figure 2A). Accordingly, at step 425, a digital command is received from the digital network 220. At step 430, the digital signal is mapped to an analog signal. In an exemplary embodiment, an SMS digital signal is mapped to an AMPS message by translating the protocol for the expected recipient of the message. This is done by using a mapping feature of each network so that the digital upgrade system 200 responds appropriately upon a poll from the digital network or the CPE Host 105. Table 1 below illustrates an. exemplary interrelation mapping table that can be used to translate commands that are received by the digital upgrade system 200 from a digital network. 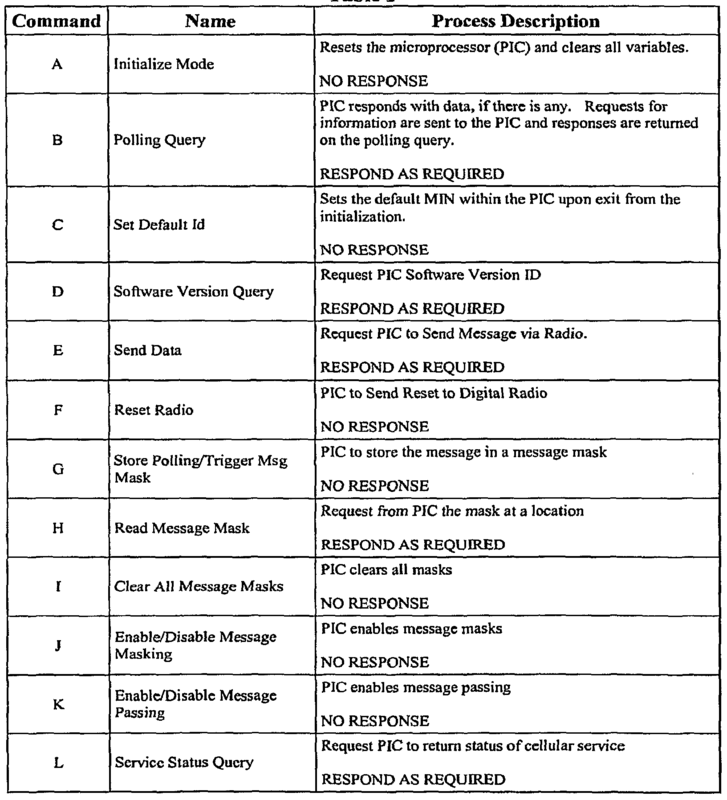 As illustrated in Table 1, a message or command intended for a wireless data device may be determined by utilizing a mobile identification number (MTN) and, in certain instances, message masks. Accordingly, according to one exemplary embodiment, the digital upgrade system 200 (or the digital radio transceiver) may utilize a MFN and mask to determine the commands broadcast over a network intended for the wireless data device. Processes for determining commands sent over a digital network by using a MIN and mask are more fully described in U.S. Patent Nos. 5,794,144; 5,873,043; 6,311,056; and 6,738,647, which are hereby incorporated herein by reference. 200, errors may occur. If an error occurs when the digital command is being mapped to an analog command, the error is immediately reported back to the digital network at step 415. That is, an error message is formatted for digital delivery and then transmitted back to the client over the digital network as step 420. Likewise, if an analog command cannot be successfully mapped to a digital command at step 410, an error message is generated and formatted for analog protocol at step 435 and then transmitted to the CPE Host 105 at step 440. Figure 5 illustrates a state machine for implementing the digital upgrade system 200, according to one exemplary embodiment. As illustrated at state 505, a main state process is initialized to begin the translation process. This state is temporary and occurs only once. It initializes software components, variables, restores stored information, and ensures the health of the digital upgrade system. Once initialization is complete, the digital upgrade system 200 enters a main state process at state 510 awaits a CPE Host 105 or digital command poll (i.e., an indication that a command is awaiting to be forwarded). The main state process comprises the interrelation table that maps the analog commands to the respective digital commands. If the CPE Host 105 polls the main state process, then state 515a is entered, which signifies that an analog command has been transmitted to the main state process. This state is completed when a complete message has arrived from the CPE Host 105. After receiving the poll, the digital upgrade system 200 translates the analog command that has been transmitted and determines whether a corresponding digital command exists for the analog command. If a corresponding digital command does not exist, or a hardware or software failure occurs, the digital upgrade system 200 enters an error handling state at state 520a and sends an error back to the CPE Host 105 to let the host know that an error has been encountered and that it needs to re-send the command or try a different command. In this state, if the information can be obtained locally (data contained within the PIC MiniPlug 315,as illustrated in Figure 3), then a response message is built and placed within the transmit buffer to the CPE Host 105. However, if the information must be obtained from a host such as a digital radio, then the request message is queued to the CPE Host 105 in state 520b. This state will then prompt a transmission to be sent on the digital network to retrieve response for the query message sent from the CPE Host 105. Similarly at state 515b, a digital network may poll the main state process by transmitting a digital command to the CPE Host 105, which is first translated by the digital upgrade system 200. As with the analog command, the digital upgrade system 200 attempts to map the digital command to a corresponding analog command. If the mapping state is successful, then the command will be processed and output at state 520b. However, if the digital command cannot be translated to an analog command, then the error handling unit 520a will send a digital error message back to the digital poll at state 515b. Figures 6a illustrates a method for translating digital commands to analog commands; Figure 6b illustrates a method for translating analog commands to digital commands, according to exemplary embodiments. As illustrated in Figure 6a, a control module (i.e., software module 245) for translating received commands/messages is initialized at figure 605a. At step 610a, the digital upgrade system 200 awaits a digital poll. When the poll for a command is received at step 615a, the command is translated from the received digital command to a corresponding analog commands at 620a. If there is an error in conversion at 625a, then a message is sent back to the digital sender (e.g., client) at step 635a. If an error occurs, the control module then returns to await digital a poll state at step 610a. If an error is not detected during translation of the digital command at step 625a, then the message is translated to the analog command. The converted message is then transmitted to the CPE analog wireless data device (i.e., CPE Host 105) at step 630a for further processing by its functionality module 110. In Figure 6b, the control module awaits a host poll at step 610b. If a poll is received at 615b, then the command is attempted to be translated to a digital command at step 620b. As with the digital conversion, if an error is detected in converting the analog command at step 625b, the error is reported to the analog wireless data device at step 635b. Otherwise, if there is no error, then the converted message is transmitted to the digital network and ultimately to the digital client at step 630b. In a preferred yet exemplary embodiment, the digital upgrade system 200 can replace an analog radio used in the Numerex Corp.'s "1650" model device. Specifically, the analog radio can be removed from the equipment and replaced with the digital upgrade system 200. For example, the "CMM-7700", marketed by or on behalf of Numerex Corp. and used in the Numerex "1650", may be replaced by the digital upgrade system 200.. In this way, the digital upgrade system 200 can allow the Numerex "1650" model device to continue to operate by interfacing with the new Cellemetry® SMS digital network. An example of the application of this invention and its exemplary embodiment would be with wireless data products, such as Numerex Corp.'s "1650". The "1650" device relies on analog control channel data transports. With the advent of Numerex's Cellemetry® Data Service data service, the "1650" device must transition from analog to digital SMS. In this case, the analog control channel data transport radio transceiver can be removed from the product and replaced with a SMS capable radio transceiver and a software module to translate interface requirements of the analog control channel data transport radio transceiver to and from the interface requirements of the SMS radio transceiver. In this way, the legacy portion of the wireless data product will continue to operate as if it were communicating with an analog control channel data transport radio transceiver when, in fact, it is actually communicating with a SMS radio transceiver using a different protocol. It should be noted that the software translation software could reside within an SMS radio transceiver or it could also be implemented as a separate physical module. The following describes the representative interface requirements of the digital upgrade system to CPE Host interface in a "1650" device, according to an exemplary embodiment. Communications with the CPE Host are in a binary format with a fixed framework consisting of: 1 byte Start character; 1 byte data length; (n) bytes of data; and 1 byte checksum. At the start of the communications process, an attention command is echoed between the CPE Host and the digital upgrade system microprocessor. This establishes the communication connection. Upon receipt, the attention command is echoed back to the CPE Host by the digital upgrade system. Upon receipt of the command the subsequent received characters are organized into a message. Any character not preceded with a "Start of Text" framework is ignored. If the message is a data message (no data), the message includes length, data, and a checksum. The data portion of the message is typically between 0 and 253 bytes. 1. A digital upgrade system for an analog wireless data device having an analog signal processing function and a pre-existing form factor comprising linear dimensions of the device, comprising: a digital radio transceiver for communicating signals via a digital wireless network, each of the signals compatible with a digital wireless data transport; and a software module, functionally connected to the digital radio transceiver, for performing the steps of: receiving a digital command output by the digital radio transceiver, the digital command carried by one of the signals compatible with the digital wireless data transport and received by the digital radio transceiver; translating the digital command into an analog command compatible with an analog data transport associated with the analog wireless data device; and outputting the analog command for processing by the analog wireless data device, wherein the digital radio transceiver and the software module are designed to replace a corresponding analog radio transceiver of the analog wireless data device and configured to fit within the pre-existing form factor of the analog wireless data device. 4. The digital upgrade system of Claim 3, wherein the software module translates the SMS digital-formatted message to an AMPS analog- formatted message. 6. The digital upgrade system of Claim 1, wherein the software module further performs the steps of: receiving an analog command from the analog wireless data device; translating the analog command into a digital command compatible with the digital radio transceiver; and outputting the digital command to the digital radio transceiver for transmission as one of the digital wireless signals via the digital wireless data transport. 7. The digital upgrade system of Claim 1, wherein the digital radio transceiver uses a MESf to determine the command received over the digital wireless network. 9. A digital upgrade system for prolonging the useful life of wireless data products, comprising: a printed circuit board of substantially the same size and shape as an analog wireless data radio transceiver, the printed board comprising: interconnecting wiring; a digital radio transceiver for communicating signals via a digital wireless network, each of the signals compatible with a digital wireless data transport; and a microprocessor operable to translate a digital command carried by one of the signals communicated via the digital wireless network into an analog command to be processed by the analog wireless data device, wherein the microprocessor performs the steps of: receiving the digital command from the digital radio transceiver, the digital command obtained by the digital radio transceiver in response to processing one of the signals compatible with the digital wireless data transport; translating the digital command into an analog command compatible with an analog wireless data transport associated with the analog wireless data device; and outputting the analog command to the analog wireless data device. 12. A method for translating a digital command compatible with a digital wireless network for processing by an analog wireless data device, comprising the steps of: replacing an analog radio transceiver of the analog wireless data device with the combination of a digital radio transceiver and a software module, each configured to fit within a pre-existing form factor of the analog wireless data device. obtaining the digital command in response to processing a signal received by the digital radio transceiver via the digital wireless network, the signal compatible with a digital wireless data transport; translating at the software module the digital command into an analog command compatible with an analog data transport associated with the analog wireless data device; and outputting the analog command from the software module for processing by the analog wireless data device. 15. A method for prolonging the useful life of an analog wireless data device, comprising the steps of: removing an analog radio transceiver from the analog wireless data device; replacing the analog radio transceiver with a component of substantially the same size as the analog radio transceiver, the component comprising a digital radio transceiver and a software module, the component designed to connect to the analog wireless data device through a pre-existing form-fitting connection, the component operative to perform the steps of: obtaining the digital command in response to processing a signal received by the digital radio transceiver via a digital wireless network, the signal compatible with a digital wireless data transport; using the software module to translate the digital command into an analog command compatible with the analog wireless data device; and outputting the analog command from the software module for processing by the analog wireless data device. 19. The method of Claim 15, further comprising the steps of: receiving at the software module an analog command from the analog wireless data device; using the software module to translate the analog command into a digital command compatible with the digital radio transceiver; and outputting the digital command to the digital radio transceiver for communication via the digital wireless data transport. 20. A digital upgrade system for an analog wireless data device having an analog signal processing function and a pre-existing form factor comprising linear dimensions of the device, comprising: a digital radio transceiver for communicating signals via a digital wireless network, each of the signals compatible with a digital wireless data transport; and a software module, functionally connected to the digital radio transceiver, operable to translate a message from the digital radio transceiver by performing the steps of: receiving a digital command output by the digital τadio transceiver, the digital command carried by one of the signals compatible with the digital wireless data transport and received by the digital radio transceiver; translating the digital command into an analog command compatible with an analog data transport associated with the analog wireless data device; and outputting the analog command for processing by the analog wireless data device, and operable to translate a message from the analog wireless data device by performing the steps of: receiving an analog command from the analog wireless data device; translating the analog command into a digital command compatible with the digital radio transceiver; and outputting the digital command to the digital radio transceiver for transmission as one of the digital wireless signals via the digital wireless data transport, wherein the digital radio transceiver and the software module are designed to replace a corresponding analog radio transceiver of the analog wireless data device and configured to fit within the pre-existing form factor of the analog wireless data device.